I am not Gluten Free, Dairy Free or Sugar Free. But I noticed recently that I grew up eating lots of rice and a little bit wheat. I thought as if my body won’t break down wheat so well because I am Japanese? In my culture (Japanese), rice is one of major carbohydrates and some people still eat rice every single meal everyday even though our younger generation is exposed to many wheat products. I remember growing up eating sweet or salty rice cracker, sweet or salty rice pancake, and sweet beans! Of course, I ate chocolate, cookies and cakes, but not as much as I eat now. I think I can be innovative with western sweets recipe! West meets East or East meets West! I have been baking with Rice Flour a lot lately. And the final products came out pretty good so far. I like the texture of Rice Flour baked sweets. It is somehow very soft and fluffy inside and crunch outside! I love it! Anyways, today I challenged myself baking SCONE. 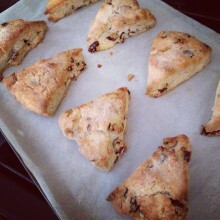 Gluten Free, Dairy Free, and Sugar Free Scone! I tweaked the amount of Agave Syrup and Milk. Just make sure your dough won’t get too soggy! This is very yummy ya’ll! Here we go! 2. Mix together the White Rice Flour, Brown Rice Flour, Salt, Lemon Zest and Baking Powder. 3. To the Flour mixture bowl, put Agave Nectar and 6 teaspoon of Coconut Oil Solid and cut them in the Flour mixture till the mixture looks like peas. 4. Slowly pour a half of Milk / Coconut Milk to the Flour & Coconut Oil mixture. Use folk to mix all ingredients together. Do not over mix. Keep pouring the rest of Milk / Coconut Milk until the Flour & Coconut Oil mixture has enough moisture to form dough. 5. Put the dough on the work surface with some White Rice Flour, do not knead but pad it down to make about 18 cm scone disk. Cut the scone disk to 8 pieces. 6. Line 8 scones (mini scone) on the baking sheet. 7. Put the remaining Milk / Coconut Milk on top of each scone and sprinkle with Coconut Sugar. Just FYI, this step is TOTALLY Optional. 8. Bake at 425F for 25 minutes. These look great! I’m vegan, so I’m excited to try this recipe out. I just need to find some coconut sugar somewhere. Hopefully Natural Grocer has some. Coconut Milk definitely adds richness to the scone! Thank you for avoiding to use xanthan gum! I am a Korean with gluten-free diet, so I had hesitated baking because most baking recipes require to use xanthan gum.. Thank you Hefy for your comment! I just don’t know about xanthan gum so I skipped it.